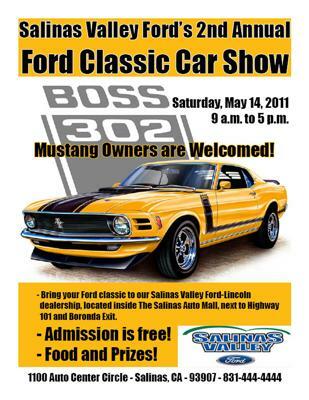 Salinas Valley Ford-Lincoln will be hosting the 2nd Annual Ford Classic Car Show starting at 9 a.m. Saturday, May 14. The North Salinas High School Band will be selling hot dogs and beverages to help fund raise for their ultimate high school band competition in Disneyland. Please bring any Ford Classic you have to the car show. We strongly advise that you spread the word of the Ford Classic Car Show to your friends, family and neighbors. Join in and write your own page! It's easy to do. How? Simply click here to return to Mustang Shows Contact.